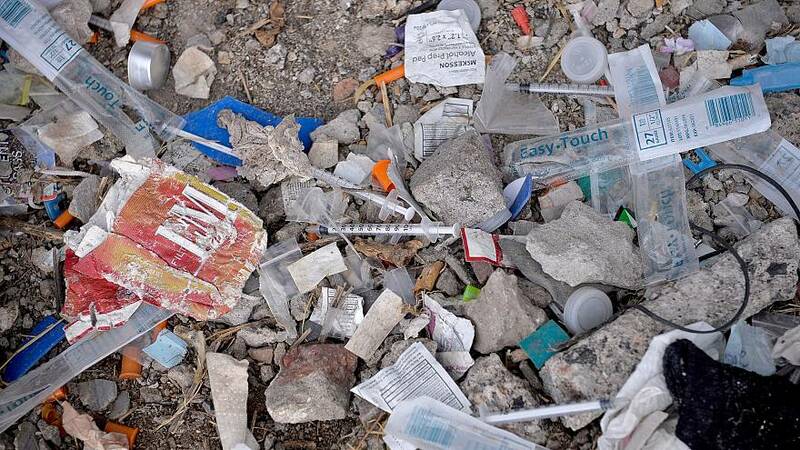 Life expectancy in the United States fell for the second year in a row in 2016 — and it's clear the epidemic of drug overdoses is at least in part to blame, government researchers said Thursday. Overall life expectancy for a baby born in 2016 fell to 78.6 years, a small decline of 0.1 percent, the National Center for Health Statistics (NCHS) team found. At the same time, mortality from drug overdoses rose by 21 percent. "This was the first time life expectancy in the U.S. has declined two years in a row since declines in 1962 and 1963," the NCHS, part of the Centers for Disease Control and Prevention, said in a statement. "The new report shows the decline in life expectancy occurred despite an overall decline in U.S. mortality," the statement added. Life expectancy is affected by mortality rates, but life expectancy calculations are forward-looking projections, while mortality rates are based on current factors. The number of people who died — not the rate — went up in 2016. More than 2.7 million people died in the U.S. in 2016, a total of 31,618 more deaths than in 2015. Life expectancy falls when people start dying at younger ages, and that's what is happening in the U.S. with the epidemic of opioid overdoses. "The escalating growth of opioid deaths is downright frightening - and it's getting worse," said John Auerbach, president and CEO of Trust for America's Health. "Every community has been impacted by this crisis and it's getting lots of headlines, yet we're not making the investments or taking the actions needed at anywhere near the level needed to turn the tide." The NCHS found that 63,600 people died of drug overdoses in 2016, and "the majority of these overdose deaths were unintentional," the NCHS team, led by Dr. Holly Hedegaard, wrote. The death rate from drug overdoses rose 18 percent a year from 2014 to 2016, the team reported. In 1999, 6.1 per 100,000 people died from drug overdoses. That rate rose to 19.8 per 100,000 in 2016. There's been a big increase in deaths from synthetic opioids, including fentanyl and tramadol. There's been a somewhat smaller increase in heroin deaths, the team found. Overdose deaths count as injuries, and unintentional injuries rose to became the third-leading cause of death in 2016, after heart disease and cancer. "Chronic lower respiratory diseases, the third-leading cause in 2015, became the fourth-leading cause in 2016," the NCHS said. Men were far more likely to die from drug overdoses than women were, but other reports have found a growing number of opiate overdoses among women. Still, as in other countries, men die younger than women. Male life expectancy fell from 76.3 years in 2015 to 76.1 in 2016, while female life expectancy stayed steady at 81.1, the NCHS said. If you make it to age 65, you'll likely live longer than 78 years. People who were 65 years old in 2016 can expect to live another 19 years, the NCHS team projected. It breaks down to almost 21 years more for women and 18 years more for men. U.S. life expectancy does not stack up well compared with other rich countries. The Organization for Economic Cooperation and Development keeps an index of life expectancy, and the U.S. falls in between Chile and Turkey in terms of average rates, and far behind Britain, France and Greece. Iceland, Switzerland and Japan have the longest life expectancies, and South Africa has the lowest. The team also looked at the infant mortality rate, which barely changed in 2016 but which also falls behind the records of other developed countries. "The 10 leading causes of infant death in 2016 accounted for 67.5 percent of all infant deaths in the United States," the report reads. They include congenital birth defects, low birth weight and sudden infant death syndrome. In 2016, 23,161 babies under the age of 1 year died in the U.S, 294 fewer than in 2015.